In our area, hummingbird season is from the last week of April through the end of October, peaking in August and September after all the young have left the nests. *Despite the old wives tales, keeping a hummingbird feeder up late in the season will NOT keep hummers from migrating. Migration is triggered primarily by light and the shortening day length, not food sources. While activity slows dramatically in October, a few birds are always seen late in the month and feeders can give these birds a boost, especially if chilly weather makes natural foods harder to find. We recommend keeping hummingbird feeders up until Halloween. Ruby-Throated Hummingbirds are found in most habitats across Illinois, including backyards. Heavily wooded, natural areas will have the highest number of birds, but even people living in newly developed subdivisions can still attract hummingbirds. Offering nectar feeders and nectar-producing plants will help you maximize the number of hummingbirds that visit your yard. Recommended Feeders - No Bees! No Ants! No Drips! 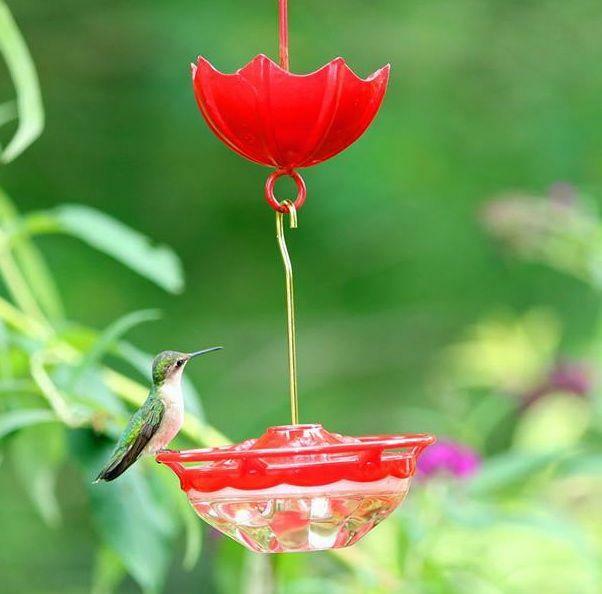 We recommend using the Wild Birds Unlimited High-Perch Hummingbird Feeder (available in four sizes/models) to attract the most hummingbirds to your yard. 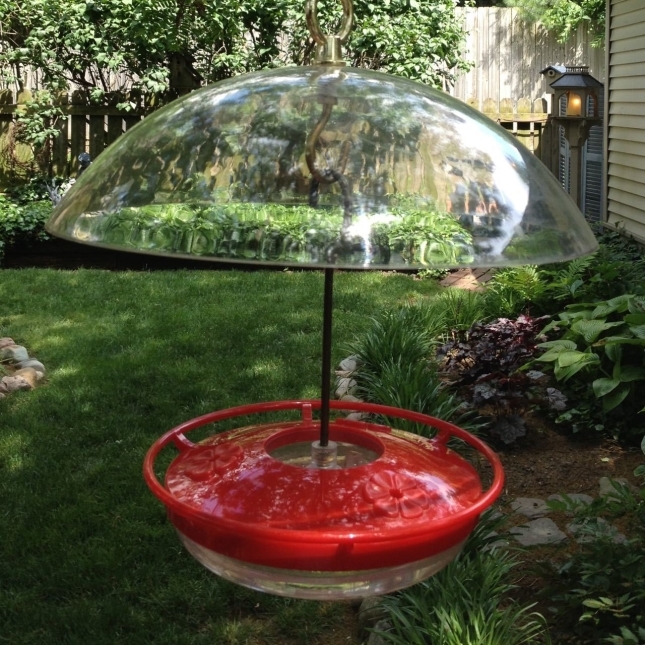 • Designed to appeal to hummingbirds, this feeder allows them to hover or perch while feeding. • The no-bottle, saucer-style design can not leak or drip and is easy to clean. • Bees can’t access the nectar solution, and the built-in ant moat deters ants. • Optional Nectar Tips can be added to exclude tiny flies/gnats in areas where they are a concern. • The feeder is extremely easy to clean. • Rain Shields act as umbrellas to keep rain from diluting the hummingbirds' nectar. 1 - Our no-boil, powdered nectar mix contains no dyes (dyes are never recommended) and is simple to make. 2 - Ready-to-use liquid nectar (again, no dyes) is extremely convenient. Just open the bottle and pour. Depending on temperatures, clean nectar feeders every two to three days; then fill with fresh nectar solution. Never use food color, honey, "raw" sugar, or artificial sweeteners or nectars containing colors, flavors, or vitamins. Research has shown hummingbirds don't need these additives and some items can actually prove dangerous. Change nectar every 2-3 days to keep bacteria from growing to dangerous levels. Failure to change nectar often enough is the #1 reason people fail to keep hummingbird coming to their feeders. 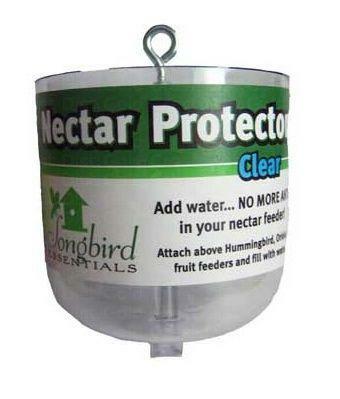 • Feeder Fresh Nectar Defender! Make feeder maintenance easier and extend the life of nectar from 2-3 days to 7-10 or more. Nectar defender uses micronutrient copper (copper is a normal part of hummingbirds' diet) to slow mold and bacteria growth. Add 1 Tbls per quart of nectar. 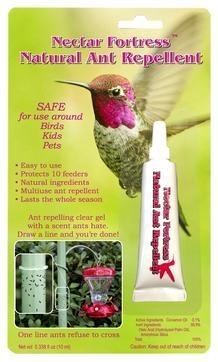 • Use a Wild Birds Unlimited Nectar Port Brush to keep your feeder clean and presentable for hummingbirds. • Keep ants out of non-WBU nectar feeders with the Nectar Protector Ant Moat, which uses water as safe barrier most ants won't cross. We do not recommend ant guards that contain pesticides. • Nectar Fortress Ant Repellent is another safe, non-chemical way of protecting feeders. It uses a gel made of food-based ingredients, ones ants don't like the scent of. Simply use the gel to create a barrier on the pole or hook on which the feeder hangs. • Hummer Rings! 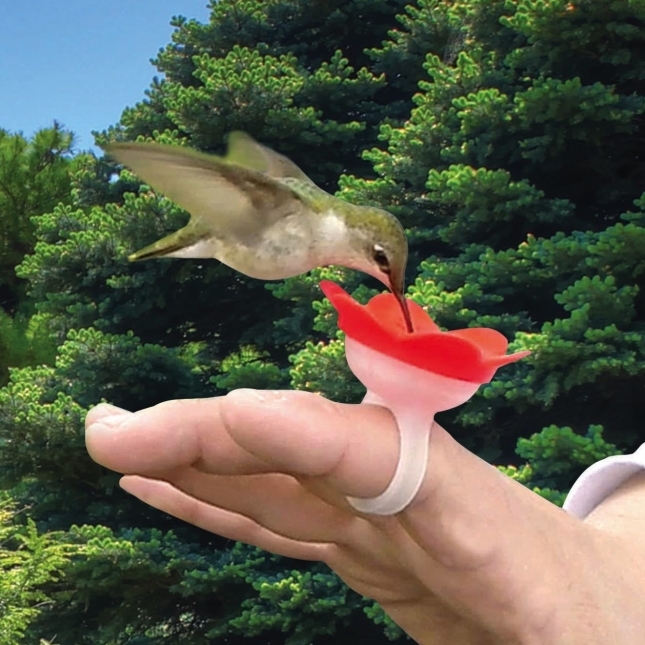 Yes, they really work to feed hummingbirds right from your hand. All the same great features as our other High-Perch feeders, with a decorative flair. 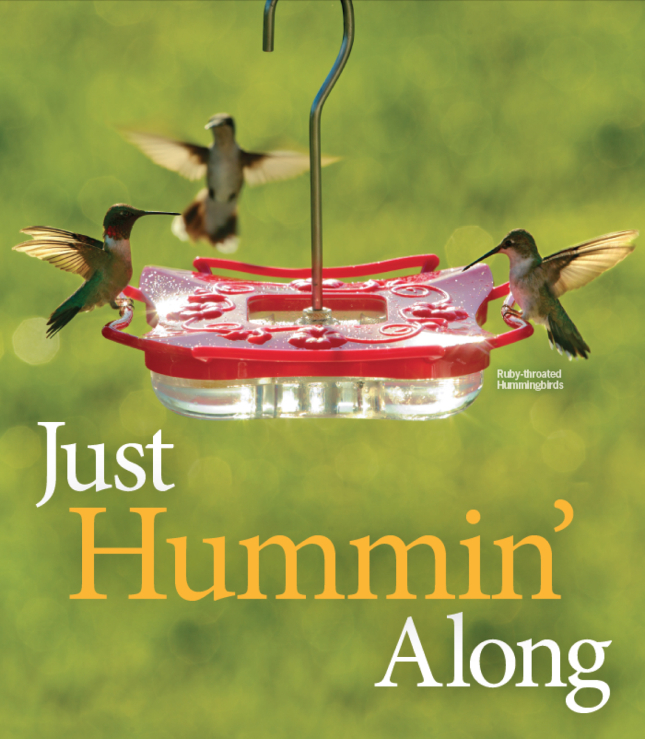 Plus, it comes with a bottom hook for linking multiple feeders together when serving high numbers of hummingbirds. Stopping Squirrels How to keep squirrels away from your bird food. Stopping Raccoons How to keep raccoons away from your bird food. Stopping Starlings and Grackles How to keep starlings and grackles away from your bird food.